Posted on November 6, 2016 November 12, 2016 by SherylPosted in FoodTagged pie, pumpkin, recipe. Previous Previous post: How Many Calories Does a Boy Need to Eat Each Day? I love this. I’m going to try making my first pumpkin pie very soon. As an aside, my maternal grandmother’s side is from Lycoming County so I really like your blog! It’s wonderful to hear that you like this blog, and that you have a central Pennsylvania connection. I have a lot of fun doing it and it’s always nice to hear when someone enjoys it. I little cloves would be a nice addition. Can’t beat a good piece of pumpkin pie topped with whipped cream. Nice pic! mmm. . . whipped cream always adds to a pumpkin pie. I was pleased with how this pie turned out. I think every pumpkin pie’s improved by using real pumpkin, and I’m sure this one’s no exception. It looks like a nice, custardy pie, and I’m certainly going to give it a try. We’re getting pie pumpkins at the farmers’ market now, so it’s time. I agree – fresh pumpkin is always better than canned. Thank you! I’m making this for Thanksgiving. Your photo is beautiful, with a taste to match. I must try this. It’s a nice (and very traditional) recipe for pumpkin pie. Pumpkin pies are always good, for hundreds and thousands of years! I like how this old recipe calls for less-processed ingredients than many other pumpkin pie recipes. It’s funny isn’t it? 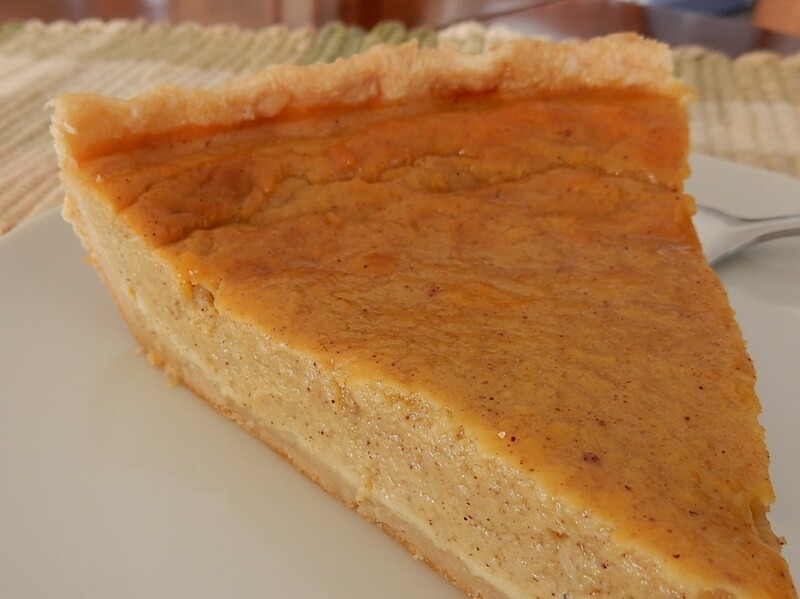 You all seem to love pumpkin pie and have your favourite recipes. But it’s fairly hopeless trying to sell it to us Brits. We don’t seem to ‘get’ it (I don’t. I find it too sweet). I wonder why we’re so different in our appreciation of this dish. Now, I’m curious. . . What are Greek pumpkin pies like? In a nutshell, many modern American ingredients were not around when our ancestors lived, and cannot be found in Europe without going to an expensive import shop or the internet. I finally figured how to make a pumpkin pie with all natural ingredients. Because I love pumpkin pie, I loved this post. It’s wonderful to hear that you enjoyed this post. Thanks for the information. This explains some of the other comments that I got. I now better understand why pumpkin pie isn’t readily available in Europe. Over the years, I’ve found that trial and error is often the best way to refine cooking techniques. This looks amazing! I have actually never had pumpkin pie, so I just bookmarked your post to make it! You should give pumpkin pie a try. It’s quite tasty. I like that they said ‘sweet milk’! Sounds delicious. Your photo is lovely. What size of can of pumpkin did you use? How did you keep you crust from burning? When I made this recipe, I reduced the heat from 425° F. to 350° F. after 15 minutes and didn’t have any problems with the crust burning. Thanks so very very much. I think an 8 inch pie is what I’ll try. I’ll use the canned pumpkin. I wish I had a fresh pumpkin to try the baking method, I bet that would really make the pie more flavorful. Canned pumpkin makes wonderful pies and it’s so much easier. Thanks for the kinds words. I agree! Pumpkin pie is a classic. I tend to like the older recipes for dessert as they tend to not be as sweet. This pie sounds good. GREAT idea. I have only been able to make a few pies in my lifetime and this may be one of them. I try, but I feel like a bit of a cheat when I buy the crust and buy the crust I must. You shouldn’t feel like a cheat for buying the crust. We all have certain foods that we find just aren’t practical to make from scratch for one reason or another. I currently make my pie crusts from scratch–but back when I lived in an apartment with a small kitchen I always bought prepared pie crusts. It was just too difficult to find enough counter space to roll out a crust. It looks delicious and perfectly baked. It was a lovely pie. This sounds like an interesting take on pumpkin pie! I think I’ll try it. Sometimes, older really is better. It was a very nice pie – though it definitely took longer to bake than the typical pumpkin pie made with evaporated milk. I have my can of pumpkin ready but may try this recipe this year. As Ann wrote, older is really sometimes better. I think that you’d like this pie. It takes longer to bake than a pie made with evaporated milk, but it turned out nicely. I’m more an apple pie girl than pumpkin but this pie looks like the very definition of what a pumpkin pie should be! I love those old church and community cookbooks, too! You cravenly skip over how to get that 1 cup of pumpkin. Your 100-year-old recipe obviously expects you to know whether to cook the pumpkin before rubbing it through a colander, but I don’t. I see you answered this problem in a comment above; recommend you edit your post to include the information about how to prepare the pumpkin. Great suggestion – thanks! I just added the comment above as a note at the end of the recipe. I am going to make this pie for Thanksgiving. I always have to go buy a can of evaporated milk! I think that you’ll like it. It just takes a little longer to bake than when made with evaporated milk. Oh, fun to see this, looks yummy! Another good one I want to try! I have lots of canned pumpkin as my dogs get a spoonful for added fiber every morning! Thanks again. I think that you’ll enjoy the pie. I never would have thought of feeding pumpkin to dogs, but it sounds very nutritious. Similar to your recipe, we double our amounts and put in two thirds sweet potato and one third pumpkin like my grandmother did. Sooooo good.